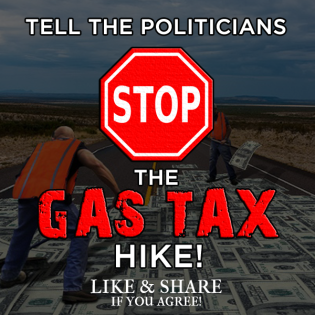 "Tell President Trump and Congress NO GAS TAX HIKE!" Tell President Trump and Congress NO GAS TAX HIKE! Recently, President Trump met with members of Congress to discuss ways to fund his infrastructure plan. Unfortunately, President Trump signaled that he would be open to a 25 cent PER GALLON gasoline tax hike. If your car has a 16 gallon gas tank (as many do), this would cost you an extra four bucks every time you fill up your car – and gasoline prices are already rising.